Fukushima Yasumasa’s travels in central Asia and Siberia: Silk Road romanticism, military reconnaissance, or modern exploration? International Symposium: Japan on the Silk Road. Encounters and Perspectives of Politics and Culture in Eurasia. Boğaziçi University (Istanbul, Turkey), 15-16 June 2012. Academia Sinica (Taipeh/Taiwan), 23-24 September 2011. Tallinn / Estonia, 24-27 August 2011. Jeju / South Korea, 27-29 May 2011. Honolulu Convention Center, 31 March-3 April 2011. Academia Sinica (Taipeh/Taiwan), 16-17 October 2010. Nanjing University, 23-25 September 2010. Click poster to enlarge (3MB PDF)! Extended version of the lecture published as an online publication of the OAG. Temple University Japan, 25 June 2007. Results of this conference have been published in a Japanese volume by Yamakawa Shuppansha, see under articles. The Politics of World War II History in Europe versus Asia with reference to the roles of civil society and public opinion, Temple University Japan, 5 April 2006. 歴史認識という概念の理論と現状 (“Historical Consciousness” in Theory and Practice). National Museum of Japanese History, 18 December 2005. Der Russisch-Japanische Krieg im Spiegel Internationaler Massenmedien (Vortrag zur Ausstellungseroffnung) (Exhibition Opening Presentation: The Russo-Japanese War in Early European Mass Media). German East Asiatic Society (OAG), 5 December 2005. ヨーロッパと東アジアにおける歴史認識と和解 (Historical Consciousness and Reconciliation in Europe and East Asia). The University of Tokyo, 5 November 2005. History Textbooks in Postwar German and Japanese Education. 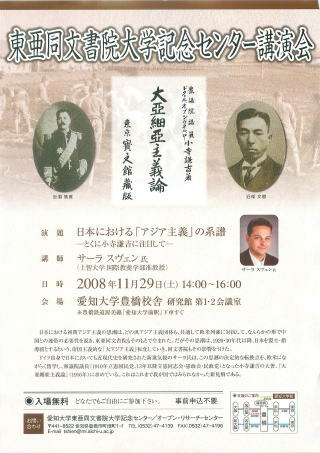 International Symposium “Germany and Japan 60 Years After the War“, Tokyo Geijutsu Gekijo, 29 October 2005. 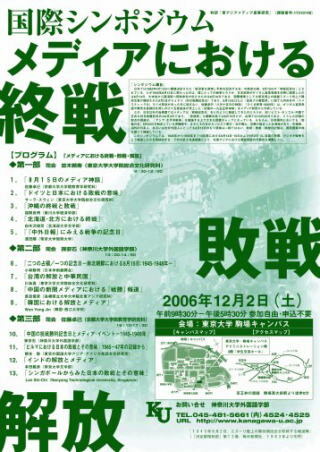 Inaugural Symposium of the Textbook History that Opens the Future (Mirai o hiraku rekishi), 29 May 2005. History&amp;amp;amp;amp;Humanities Study Group, German Institute for Japanese Studies (DIJ), Tokyo, 30 March 2005. Politik, Erinnerung und Geschichtsbewusstsein in Japan (Politics, Memory and Public Opinion in Japan). Takeuchi Yoshimi, Asianism and international relations. What can philosophers tell us about politics? International Symposium “Takeuchi Yoshimi – Thinker of a Different Modernity in East Asia?”, Ruprecht-Karls-Universitat Heidelberg, 7-10 September 2004. Pan-Asian Societies in Japanese Foreign Relations: Uchida Ryohei and the Kokuryukai. Annual Meeting of the Association for Asian Studies (AAS), San Diego, 4-7 March 2004. Pan-Asianism in Late Meiji and Taisho Japan: Kodera Kenkichi and His View of International Relations. 3rd International Convention of Asia Scholars (ICAS 3) in Singapore (Panel 173: “Regionalism East and West: Considering Pan-Asianism in Modern Japanese History and Politics”), 19-22 August 2003. 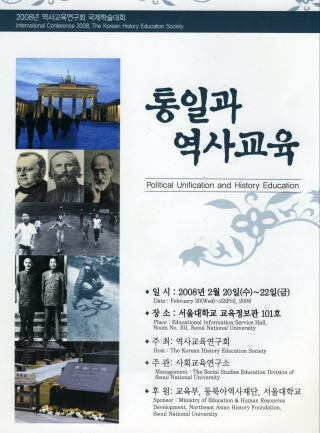 日韓関係における歴史問題 (The history problem in Korean-Japanese relations). 大正デモクラシーにおける日本の政軍関係 (Civil-Military Relations in Taisho Japan). 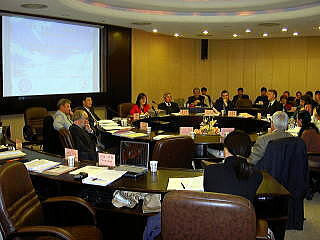 International Symposium “East Asia and Europe: Coming to terms with the past and international relations”, German Federal Agency for Civic Education, Bruhl, 8 April 2003. New Developments in the Recent Japanese History Textbook Debate. 12th Convention of Japanese Studies in German-speaking Countries (“Japanologentag”), University of Bonn, 30 September-3 October 2002. Implications of the Recent Japanese History Textbook Debate for Japanese-Korean Relations. Japan and Korea. 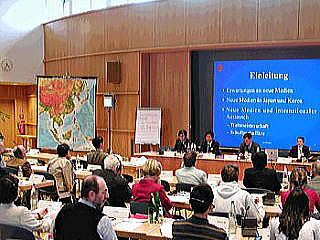 International Symposium hosted by the German Federal Agency for Civic Education, the Japanese Cultural Institute Cologne and the German Institute for Japanese Studies, Bruhl, 25-28 September 2002. Empire in flux: the Siberian Intervention and Japanese Colonial Empire after World War I. 6th Asian Studies Conference Japan (ASCJ), Sophia University, Tokyo, 22 June 2002. Pan-Asianismus im Japan der Meiji- und Taisho-Zeit: Wurzeln, Entstehung und Anwendung einer Ideologie (Pan-Asianism in Meiji and Taisho Japan). 2nd symposium “Asiatische Selbstbehauptungsdiskurse” in Seoul, 16 November 2001. 「ドイツ東漸論」－岐路に立つ日本外交と第一次世界大戦 (The “German advance to the East” – Japan’s foreign policy at a crossroads during World War I). 7th symposium of the Association for Japan Sea Rim Studies, Toyama, 11 November 2001. Background and Results of the Textbook Selection Process. DIJ History &amp;amp;amp;amp; Humanities Workshop “Making History – The Quest for National Identity through History Education, German Institute for Japanese Studies (DIJ), Tokyo, 21 September 2001. “Pan-Asianism” – a Preliminary Approach. 2nd International Convention of Asia Scholars (ICAS 2) in Berlin (Panel 053: “Discourses of Cultural Uniqueness in Japan, China and Korea”), 10 August 2001. The ’German Peril’: German POWs in Siberia, 1917-18. 5th Asian Studies Conference Japan (ASCJ), Sophia University, Tokyo, 24 June 2001. Military and Politics in Modern Japan: The Imperial Army during the Meiji and Taisho Eras. History&amp;amp;amp;amp;Humanities Study Group, German Institute for Japanese Studies (DIJ), Tokyo, 14 March 2001. 4th symposium of the Association for Japan Sea Rim Studies, Akita, 31 October 1998.